We’ve been waiting and we finally have a 4K/8MP camera to add to our Sibell line of products. 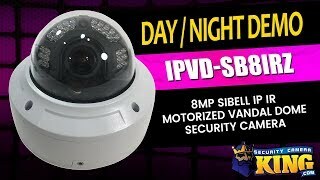 This is an 8MP Indoor Outdoor Ultra HD 4K Vandal Dome Security Camera. With this Ultra High Definition camera installed at your premises, you can be confident that the video recording will have more detail than you could have ever imagined before. Now, if you ever have the misfortune of being a victim of a crime against yourself or your property, you’ll be much more likely to be able to see the detail of things like tattoos, piercings, clothing, and facial features. This would look great on a standard monitor but imagine 3840 x 2160 pixels on your new 4K display monitor. Enhanced by a 3.3-12mm lens, you’ll be able to see high definition over a large area or you can use the motorized zoom to zoom in on a particular subject that you want to get a closer look at. Imagine you’re watching a live stream on day and you see something suspicious going on at the cash register. Go to your NVR or your mobile device and zoom in for a better view. This camera also has built in IR (infrared) that lets you see up to 98 feet in total darkness! You’ll have lots of different options with this camera including power supply. You can use a standard 12V DC power supply or you can utilize what is called PoE (Power over Ethernet) which uses the CAT5 network cable you are already using. This allows you to power your camera by plugging it into the back of your NVR or a PoE switch. Another great feature is the audio in and out connection that allows you to connect a microphone and/or speaker so you can have 2-way communications or just hear what people are saying on the other end. As with all of our Sibell products, this camera comes with a 2 year warranty, FREE US based tech support, and FREE remote viewing software.